ALL PATTERNS ARE AVAILABLE AS PRINTED PATTERNS AND E-PATTERNS!!! 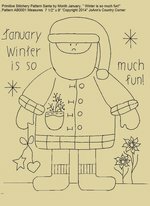 SANTA BY MONTH JANUARY "WINTER IS SO MUCH FUN!" 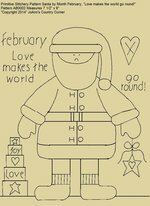 SANTA BY MONTH FEBRUARY "LOVE MAKES THE WORLD GO ROUND!" 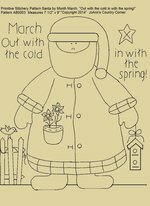 SANTA BY MONTH MARCH "OUT WITH THE COLD IN WITH THE SPRING!" 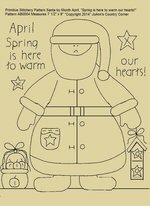 SANTA BY MONTH APRIL "SPRING IS HERE TO WARM OUR HEARTS!" 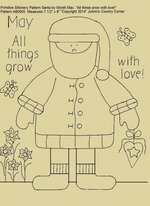 SANTA BY MONTH MAY "ALL THINGS GROW WITH LOVE!" 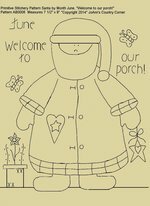 SANTA BY MONTH JUNE "WELCOME TO OUR PORCH!" 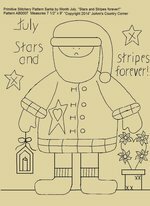 SANTA BY MONTH JULY "STARS AND STRIPES FOREVER!" 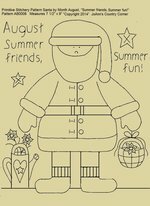 SANTA BY MONTH AUGUST "SUMMER FRIENDS, SUMMER FUN!" 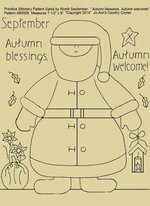 SANTA BY MONTH SEPTEMBER "AUTUMN BLESSINGS, AUTUMN WELCOME!" 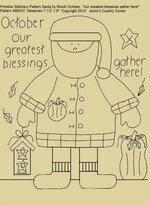 SANTA BY MONTH OCTOBER "OUR GREATEST BLESSINGS GATHER HERE!" 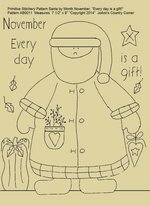 SANTA BY MONTH NOVEMBER "EVERY DAY IS A GIFT!" 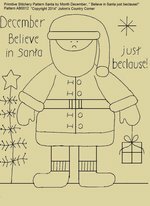 SANTA BY MONTH DECEMBER "BELIEVE IN SANTA JUST BECLAUSE!" CROW BY MONTH JANUARY "THERE'S SNOW PLACE LIKE HOME!" 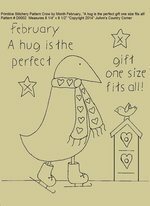 CROW BY MONTH FEBRUARY "A HUG IS THE PERFECT GIFT ONE SIZE FITS ALL!" CROW BY MONTH MARCH "BLOSSOM BY BLOSSOM, THE SPRING BEGINS!" CROW BY MONTH APRIL "APRIL SHOWERS BRING MAY FLOWERS!" CROW BY MONTH MAY "BLOOM WHERE YOU ARE PLANTED!" CROW BY MONTH JUNE "FRIENDS AND SUMMER THEY JUST GO TOGETHER!" CROW BY MONTH JULY "LAND OF THE FREE, HOME OF THE BRAVE!" CROW BY MONTH AUGUST "FRIENDS ARE THE SUNSHINE OF LIFE!" CROW BY MONTH SEPTEMBER "SUMMER SUNSHINE FADES BUT MEMORIES LAST FOREVER!" CROW BY MONTH OCTOBER "WELCOME TO THE PUMPKIN PATCH!" CROW BY MONTH NOVEMBER "TAKE TIME TO BE THANKFUL!" CROW BY MONTH DECEMBER "MAY ALL YOUR DREAMS COME TRUE!" 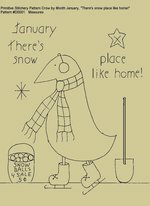 #B128 Primitive Stitchery Pattern Crow by Month January "There's snow place like home!" Measures approx. 8 1/4" x 9 1/2"
#B129 Primitive Stitchery Pattern Crow by Month February "A hug is the perfect gift one size fits all!" 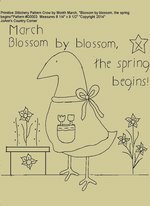 #B130 Primitive Stitchery Pattern Crow by Month March "Blossom by blossom, the spring begins!" 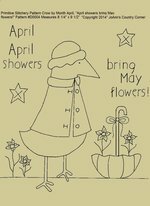 #B131 Primitive Stitchery Pattern Crow by Month April "April showers bring May flowers!" 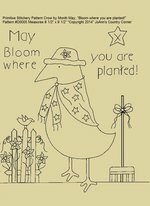 #B132 Primitive Stitchery Pattern Crow by Month May "Bloom where you are planted!" Measures approx. 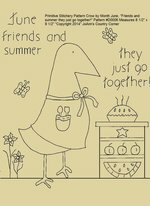 8 1/2" x 9 1/2"
#B133 Primitive Stitchery Pattern Crow by Month June "Friends and summer they just go together!" 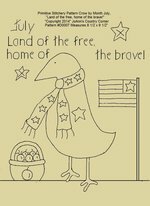 #B134 Primitive Stitchery Pattern Crow by the Month July "Land of the free, home of the brave!" 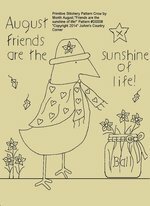 #B135 Primitive Stitchery Pattern Crow by Month August "Friends are the sunshine of life!"